Home / News / It’s Tricky, it’s Tricky Tricky Cats this FRIDAY! It’s Tricky, it’s Tricky Tricky Cats this FRIDAY! Tricky Cats Available This Friday! The rambunctious Tricky Cats will be available this Friday! 13 mischievous kitties- which one will you get?! Each Tricky Cat is a handful of fun and trouble, just like a real cat! Will you get Lucky, Cranky or the chase?! Whichever feline finds you comes with a handy dandy mini accessory! 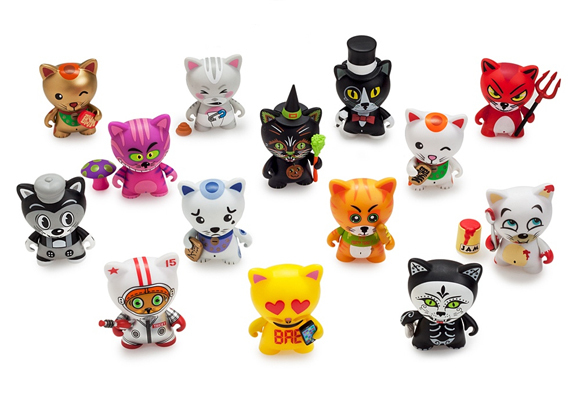 The Tricky Cats Blind Box Mini Series will be available on Kidrobot.com this Friday, October 30th and in stores soon. Each figure retails for $9.99. The post It’s Tricky, it’s Tricky Tricky Cats this FRIDAY! appeared first on Kidrobot Blog.